My husband loves to cook large quantities of soups and chilis but we don’t really have anything that would be big enough, so he improvises and uses a few big pots at the same time. He asked me not to long ago to see about getting a really large Nesco Roaster. I contacted Nesco and was thrilled when they said yes to one of their roasters. Not only did they say yes, but they sent us their 18 quart roaster. I’m sure you can imagine how excited my husband was when I told him that he was getting exactly what he asked for. For the next week he was watching the mail/packages to see if it came. Finally (really wasn’t finally, it only took a few days) it came. He wanted to use it right away, so he made chili. Unfortunately for me, he forgot I needed pictures and had already made, packaged up and cleaned up the 18 quarts of chili before I could get one picture. That just meant that he had to use it again soon. For the second round he decided to make beef stew. In our house we go big or go home, so in true fashion he made a TON of beef stew. 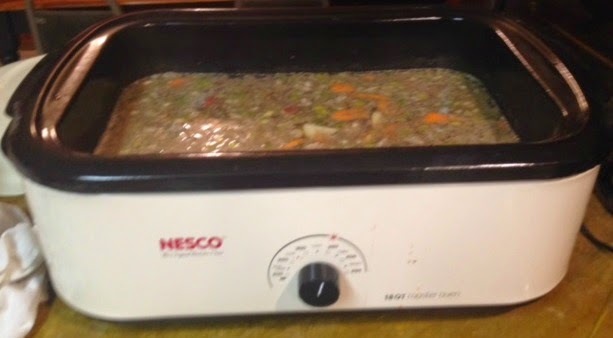 We love the 18 quart Nesco Roaster. It assured that he could make pretty much as much as he wanted and didn’t make as much of a mess. The only thing I didn’t like was that it is so big, i had to find a place to store it (I know, touch life lol). The stew by the way turned out awesome, it was so tender and good. We thought with it being so big that it would take a lot longer to cook the stew, but we didn’t see any difference with the 18 quart vrs the 5 quart. We can’t wait to use it next week for Thanksgiving (OMG that’s next week!) eeek. • Unique CIRCLE OF HEAT® construction means food is cooked from the side, not the bottom, for more moist cooking results. • Removable cookwell with porcelain coating. • Automatic temperature control assures even, energy-efficient cooking, every time. • The Automatic Temperature Control provides a wide range of temperature settings from (200ºF-450ºF) which allow you to slow cook, roast, bake, steam – as well as sear and brown foods. • Includes a chrome steel rack with handles for safe, easy insertion and removal of hot foods. • Your 18-Quart Roaster Oven comes with an attractive, informative Use/Care and Recipe Guide. • Holds up to a 22# turkey. • 1425 Watt, 120 Volt. 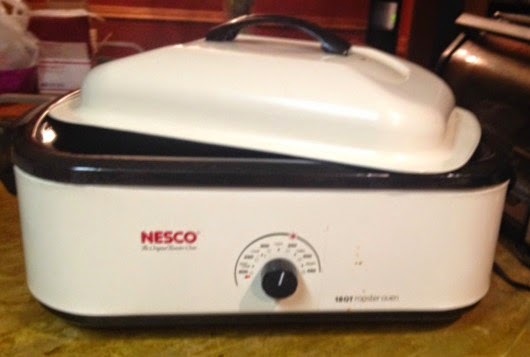 Nesco is giving one lucky winner their own 18 quart Nesco Roaster. Please use the giveaway Tools below for your chance to win. We could really use a new toaster so the FOUR SLICE TOASTER in THUNDER GREY would be nice. I would love a pressure cooker. I've wanted one for years but never been able to afford to add one to my kitchen. I like the food dehydrators and a slow cooker. I use my roaster often. They have so many great things! I think the Jet stream 2 oven looks good! I also entered the AliveCor giveaway. I like the bread maker. Im excited about the pressure cooker. I need one badly. I like the FD-1040 Gardenmaster Digital Pro Food Dehydrator. I would love to get a dehydrator. I had one before and gave it away. I wish I still had my Nesco dehydrator. I entered the AliveCor heart monitor giveaway. I also like the Digital Control Blender. I like the 12 Program automated bread maker. This would be great for Thanksgiving. I like the 650 Watt Food Grinder W/ #10 Head. I love the vacuum sealer. I think that would save me a lot of money!! I like the Gardenmaster Digital Pro Food Dehydrator. I would love the pressure cooker. Mine is over twenty years old. I'd like to have their FD-61 Snackmaster Encore Food Dehydrator. Id like to try the 6 liter pressure cooker or the oval slow cooker. Besides the roaster, I would Love to have the 4 Qt Steamer with Rice Bowl . Thaanks for the chance to win! I would also love to have the Snackmaster® Square Dehydrator & Jerky Maker! I really like the looks of the Waffle Maker. I would also like to have the Nesco black vacuum sealer. My friend has a Nesco that I have been coveting. I also like the slow cookers. 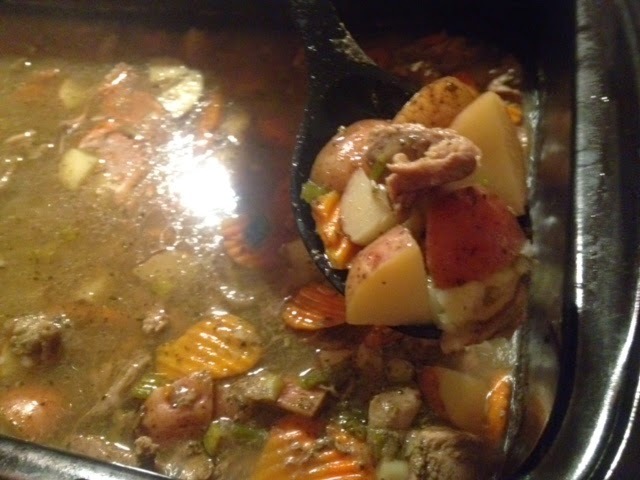 I love to do slow cooked dishes in fall and winter. I like the 1.5 Quart Slow Cooker (Metalic Blue) -- I really need a new one. I would love the 4 quart steamer or the vacuum sealer. Love the Jet Stream Oven with Digital Timer! I like the 500 Watt Stainless Steel Food Grinder. Thanks. I've been really wanting a Pressure-Cooker and they have one. I'd love a dehydrator for fruits and jerky! I like the bread machine. We had one that finally broke a few years ago. but we never replaced it. I went to Nesco and had a hard time deciding between the food grinder, pressure cooker, waffle maker, blender, and vacuum sealers. Could I get one of each please? lol What I actually NEED is a new blender though and that digital control one looks nice. I also really like the FD-1040 Gardenmaster Digital Pro Food Dehydrator. I also like the FD-2000 Digital Square Dehydrator. I entered for the personal coffee maker. I would love to have the Jet Steam Oven! I could make lots of family dinners and healthier! !